In an “eye-opening memoir” (People) “as beautiful as it is discomfiting” (The New Yorker), award-winning writer Apricot Irving untangles her youth on a missionary compound in Haiti. Apricot Irving grew up as a missionary’s daughter in Haiti. Her father was an agronomist, a man who hiked alone into the deforested hills to preach the gospel of trees. Her mother and sisters spent their days in the confines of the hospital compound they called home. As a child, this felt like paradise to Irving; as a teenager, it became a prison. Outside of the walls of the missionary enclave, Haiti was a tumult of bugle-call bus horns and bicycles that jangled over hard-packed dirt, road blocks and burning tires triggered by political upheaval, the clatter of rain across tin roofs, and the swell of voices running ahead of the storm. Poignant and explosive, Irving weaves a portrait of a missionary family that is unflinchingly honest: her father’s unswerving commitment to his mission, her mother’s misgivings about his loyalty, the brutal history of colonization. Drawing from research, interviews, and journals—her parents’ as well as her own—this memoir in many voices evokes a fractured family finding their way to kindness through honesty. Told against the backdrop of Haiti’s long history of intervention, it grapples with the complicated legacy of those who wish to improve the world, while bearing witness to the defiant beauty of an undefeated country. A lyrical meditation on trees and why they matter, loss and privilege, love and failure. The Gospel of Trees is a “lush, emotional debut...A beautiful memoir that shows how a family altered by its own ambitious philanthropy might ultimately find hope in their faith and love for each other, and for Haiti.” (Publishers Weekly, starred review). Apricot Anderson Irving is currently based in the woods outside Portland, Oregon, but has lived in Haiti, Indonesia, and the UK. Her missionary parents moved to Haiti when she was six years old; she left at the age of fifteen. She returned to Haiti in the spring of 2010 to cover the earthquake for the radio program This American Life. She is the recipient of a Rona Jaffe Foundation Writers’ Award and an Oregon Literary Arts Fellowship. Her renowned oral history project, BoiseVoices.com, was a collaboration between youth and elders to record the stories of a neighborhood in the midst of gentrification. She loves to garden, and on rare occasions she can be persuaded to belt out Irish folk songs in bars. The Gospel of Trees is her first book. "Finely crafted...Irving moves seamlessly between the wide-eyed perspective of the child and the critical gaze of the adult, creating a tale as beautiful as it is discomfiting." 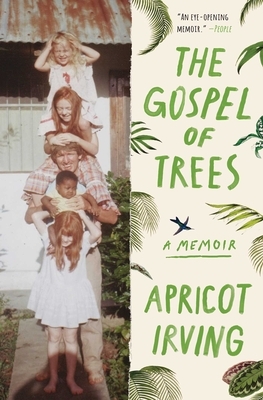 "Apricot Irving’s honest memoir highlights the good, the bad and the ugly of missionary life, challenging traditional “white savior” narratives." "Provide[s] a useful view of the inherent ethical and moral ambiguities of well-meaning but sometimes ineffective charitable interventions in Haiti." "A timely and often insightful perspective on modern-day Haiti."